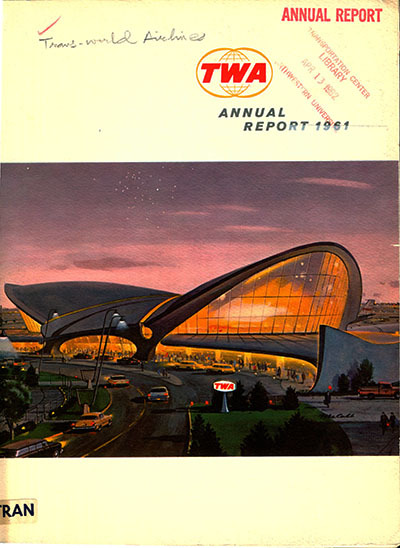 The Transportation Library’s collection of annual reports documents the financial and operational history of transportation companies around the world from the 1820s to the present. Originally compiled for the companies’ investors, the reports contain a wealth of primary source information for researchers in the history of transportation as well as those researching transportation in the current day. Industries represented include pipeline, infrastructure, trucking, automobile, and bus companies, railroads, transit corporations, cruise ships, airlines, and federal agencies, with a particular strength in 19th century U.S. railroads. The reports contain such data as financial statements, asset inventories, maps, and descriptions of the companies’ operations. Many of the reports are also of interest for their visual design, particularly during the mid-20th century, and for historical photos of equipment, staff, passengers, and even political dignitaries. International in scope, the collection numbers over 18,000 reports from companies both large and small: a sampling includes the Cuba Railway Company, the Kowloon-Canton Railway, the Triborough Bridge and Tunnel Authority, American Airlines, and East African Airlines.